Yummy. It was 10 pm by the time the cake was frosted. Julie would have approved. She always appreciated my culinary attempts. Cake and frosting recipes are from "Five Roses: A guide to Good Cooking" the 25Th edition. 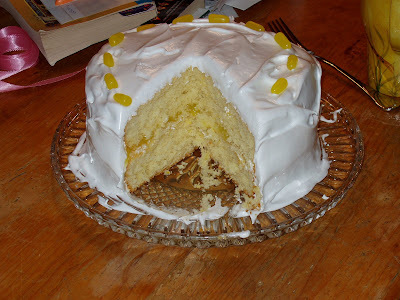 The basic 'white cake' recipe with the Lemon variation. The frosting is the '7 Minute Frosting'. The lemon filling is from a jar, 'E.D. Smith Lemon'. This was the same cookbook that Julie, my husband and myself used to bake our wedding cake over 21 years ago.